This page is a listing of the minimum requirements for specific Rebel Legion costumes. Although this list is extensive, it is meant to cover the more common costumes and is not meant to be a complete list of all possible costumes that may be admitted by the Rebel Legion. If your costume is not listed here, you should consult the Legion Membership Officer (LMO) to see if it will be admissable. Changes or additions to this list may be submitted here. For easier reference, the master list has been broken down by character. Black base v-neck collar shirt. Red silken mid-calf length robe with black burnout stripe fabric over the lower sleeve portion showing the red beneath. Sleeves should be lined in black silken lightweight fabric. Black tabard/tunic with burnout stripes showing a red fabric lining, two tiered below waist. Wide black oval belt in leather or faux leather. Black riding style boots; zippers are allowed but must be covered. Gold striped fitted tiara following forehead to behind ears with twin curving arcs of hair alternating between hair and red fabric that start at the ears and widen up toward the center top of the head. Back of hair is a high ponytail folded under once and bound again near the end. No bangs. Naturally-occurring hair colors only. White make-up on face and neck must be applied evenly. No splotchy make-up. Red upper lip, white lower with red stripe down center. Twin red dots on apples of cheeks centered beneath the eyes. Ombre-dyed velvet gown with a hooded front and back tabard, shifting from a dark/burnt orange hood and shoulders to a pale yellow hem. Hood should be lined; tabard may be either floor-length or end gathered at the waist. Large pointed sleeves need to match color gradient. No panne velvet. Fitted under hood of a red matte fabric with an obvious brim and high collar. Fitted under sleeves of a red matte fabric with detailed red lace appliqu� on forearm at the hem. Large waist sash of a red matte fabric with a pleated, asymmetrical cross-over in the front that widens at the back to nearly or completely cover the hips and rear. Hair should be pulled back and hidden under the hood. No bangs. Naturally-occurring hair colors only. Low-heeled coordinating tailored pumps or flats. Wine/Burgundy calf length velvet or velvet-like overcoat with a fitted closure in the front above waist then pulled back and pinned to expose the legs. No panne velvet. Reddish satin lining for underside of belled wide sleeves and coat lining. Gold embroidered ribbon running up the coat side seams, around the shoulders of bodice, and back down the side seams. Ribbon also runs across the coat lining at knee-length. Undershirt in reddish/dark pink matte fabric with extra long fitted sleeves and ribbing detail on the shirt and sleeves. Wine/Burgundy velvet or velvet-like pants with gold trim down sides. No panne velvet. Black riding style boots with no visible zippers. Black leather or leather-like belt with black small fitted but firm holster on the right-hand side and silver belt buckle with Naboo symbol detail in gold. Large twice folded ponytail at back of head. No bangs. Naturally-occurring hair colors only. [color=blue]Silver short- or long-barrel Naboo blaster. Reviewed by CSC/LMO 10/15/12, effective 11/1/12. Golden yellow Fortuny-pleated underskirt with square neckline and long sleeves. Neckline and sleeves should be edged in cord. Golden yellow wide waist sash/belt extending from upper hips to just under the bust of a crinkled fabric. Golden yellow velvet jacket with large hood with point at rear and two in front that sit over the shoulders, large round sleeves lined in gold satin. The sleeves, back and front hood points and the front of the hood by the forehead should have �abstract bird� designs on the velvet. No panne velvet. Medium gray floor length under dress with long sleeves that are ruched (or gathered) from the elbow to the cuff. Charcoal gray floor length velvet outer tunic with long, narrow, open, sleeves, and side vents from below the hip to the hem. No panne velvet. Black and maroon cross-dye, iridescent hooded scarf with a maroon or dark berry lining. The scarf becomes long and thin, reaching past the knees and has a maroon tassel on each end. Black and maroon cross-dye, iridescent hooded scarf with a maroon or dark berry lining. The scarf becomes long and thin, reaching past the knees and have a maroon tassel on each end, and should be wrapped around the neck on the outside of the maroon velvet cloak. Floor length, red/maroon velvet cloak with large, drapey satin lined hood. Naboo Royal symbols, etched or ironed into the velvet run down the front of the cape on either side of the center front opening and across the hood. Deep charcoal gray-blue velvet hood with protruding shaped shoulders. The hood and shoulders have pintuck stitching running toward center of body at downward angles, contoured inward to end in a long pointed tabard with the point at mid-shin. No panne velvet. A gold metallic scroll braid runs down the center front and the center back of the hood, each end topped with a gold metallic diamond. Blue grey satin A-line gown pleated in similar style as hood with the pleats angling up toward center of body and long sleeves with pleats running vertically down length of sleeves. Celadon green under dress with sheer cream fitted textured or pintucked sleeves. Medium green velvet poncho lined in berry/green iridescent fabric. The poncho is longer in the back than in the front. No panne velvet. Medium green velvet high collar and long pointed tabard with royal Naboo symbols down front. Medium green velvet hood lined in berry/green iridescent fabric. Floor-length loose, pleated gown in a crinkled white matte fabric with knuckle-length fitted sleeves. The left side front of the gown has a long black bead multi-strand sash that falls to below the knee and can be seen through the cloak�s opening; the sleeves have a wide lace band encrusted with jet beads and sequins near the hems, and draped with small strands of jet beads. Floor length cloak with long draped sleeves, a short train and a high collar in a heavy white fabric textured with squares and lined in plain white fabric. 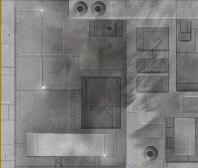 The opening of the cloak is at the left front. Black Asian-inspired squares decorate the front opening and the sleeve hems, as well as the point of the sleeve lining. Black lace and black jet beads cover the mandarin collar, are draped around the neck like scarf and form epaulettes on the shoulders. Hairpiece has a wide down curve shape with twisted strands folded from base of neck over top with ornate filigree gold bands binding the strands and a filigree gold cap resting on forehead with a small gold circular pendant. No bangs. Naturally-occurring hair colors only. The gown may be distressed to show explosion burns, the hair and face mussed and smudged, and the shoes omitted. Dark purple Fortuny-pleated silken under dress with a high-collar and fitted sleeves. Dark purple velvet ruched (or gathered) poncho with attached hood; the hood should have some structure. No panne velvet. 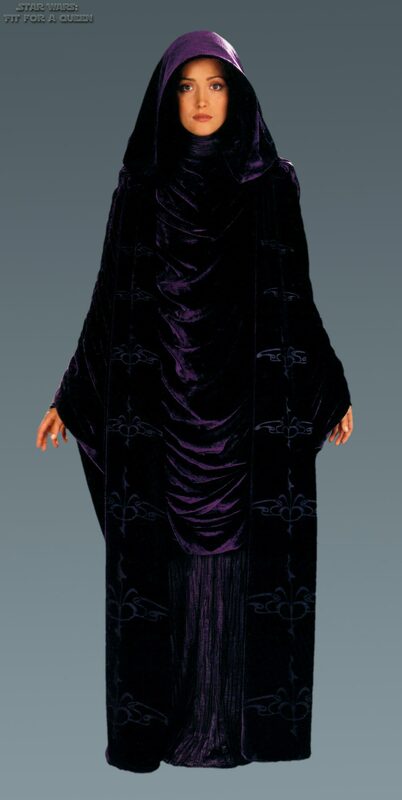 Dark purple velvet floor-length tabards, draped over front and back, bearing etched or ironed-on royal Naboo symbols. No panne velvet. Hair should be parted in the center and gathered at the crown into a high bun ringed in a thin braid, with a fall of hair folded beneath. No bangs. Naturally-occurring hair colors only. White silken ribbed floor length gown with long fitted sleeves and a high fitted collar. Gray textured floor length loose rectangular robe in the Byzantine fashion (similar to Padme�s Veranda Robe), the collar trimmed with a pointed purple band embroidered in pink, purple and turquoise blue. Hair is pulled into a loose ponytail with locks left to drape over the right shoulder. No bangs. Naturally-occurring hair colors only. A-line under dress in a matte black fabric, with a high fitted collar and leg o� mutton sleeves (large and gather above the elbow and fitted below) which end as fingerless gauntlets. Charcoal gray overdress with an uneven black dotted design. The bodice has a drop collar and a princess drop waist, with black matte piping edging the collar, drop waist and all finished hems/armholes as well as an inverted V beneath the bust. The skirt is petal shaped, splitting open in the front to sweep longer in the back. Black jet beaded brooch shaped like a fat teardrop nestles at the bosom. Hair is parted in the centered and gathered to a main braid in the back with two thinner braids criss-crossed in jet beads draping over each shoulder. No bangs. Naturally-occurring hair colors only. A-line underskirt in medium gray crinkled fabric. Fitted bodice in medium gray crinkled fabric with a high structured collar and princess drop waist. Floor length coat in a medium, almost dark purplish-gray velveteen fabric with a houndstooth-like pattern. The coat has a large shawl collar with a second lapel lined in iridescent turquoise and silver silken fabric beneath the main collar drafted to form contoured pockets that end at mid-thigh, with the bottom points each tied in a knot. An embroidered, peacock feather-like decoration rimmed in gold cord, in colors of purple, gold, blue, orange and gray, is attached to a wide band of coat velveteen and forms the closure of the coat. The coat also has long fitted sleeves which flair at the knuckles and has a small train length in the back. Hair is parted in the center with the back portion gather into two high coils at the crown of the head with smaller coils at the base in front and back, and two front sections braided and softly draped to the back and wrapped about the coils. No bangs. Naturally-occurring hair colors only. Light, almost medium gray hooded cape that falls below the waist and criss-crosses in the front with small triangular bib is attached at the top of the cape�s front. Dark purple piping runs down both front pieces and the back, dividing the cape into even sections. The hood has a wide dark purple band along the front edge and should hold some shape. Lace appliqu�s are attached to the front, bib, and across the hood, dyed light lilac. Dark purple, mock-neck, long sleeve shirt should fall to just below the waist. Floor length purple velvet skirt has pleats all the way around. No panne velvet. 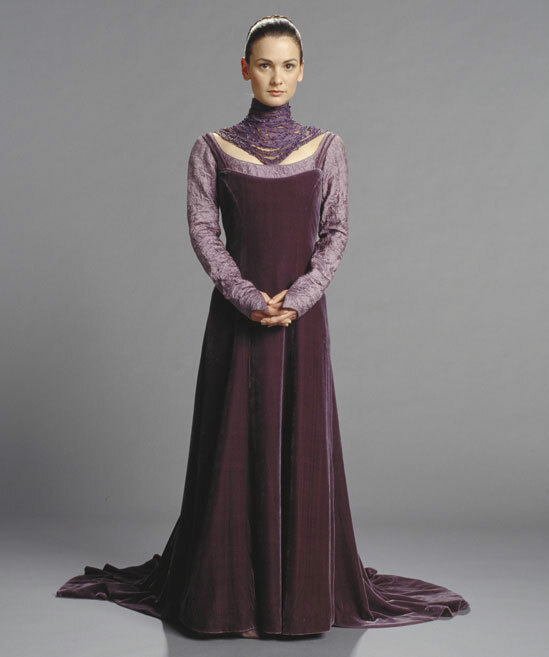 Light purple or lilac floor length under dress of a silken crinkled fabric with a low, wide collar and long fitted sleeves shaped to points over the knuckles. 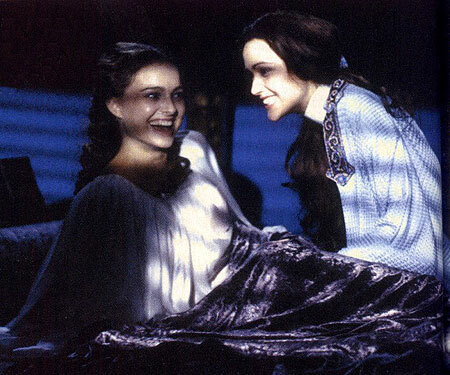 Medium purple velvet floor length overdress with double spaghetti straps and a wide, long fanned train in the back, fitted to the body with princess seams in front and back. No panne velvet. Medium purple high collar and yoke made up of strips of chiffon cut on the bias, serge-finished with purple iridescent and frosted seed beads and tacked to create the collar and yoke. The strips are gathered to the center back of the under dress neckline and pinned with a large beaded fabric pansy in shades of purple, pink, red, orange, yellow and cream. The remaining lengths of the strips are left to fan loosely down the back almost to the floor with no beaded edges. Hair is pulled back from the face and gathered into a large, multi-strand braided bun at the crown of the head. No bangs. Naturally-occurring hair colors only. Floor length pleated under gown with a wrapped inner hood of tie-dyed velvet in colors of green, red and amber. No panne velvet. Dark green velvet cloak with a large, draping hood, lined in green silken fabric. No panne velvet. 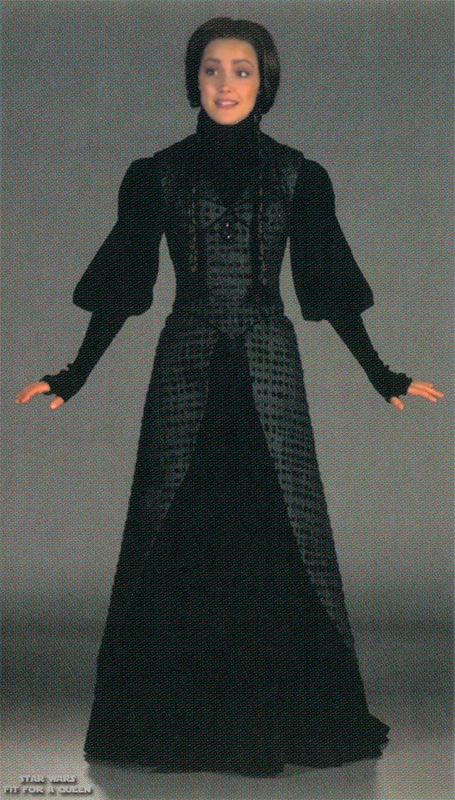 Dark green wide velvet tabard etch or ironed on inverted Naboo symbols, stretching to a point at knee length. No panne velvet. Dark maroon floor length under dress in a matte fabric, most likely velvet. No panne velvet. Maroon floor length silken cloak with wide pleats angled up towards the center front. Dark maroon large draped velvet hood. No panne velvet. All standards effective 2/1/13 unless otherwise indicated.